MEXICO CITY — With a swipe of his pen this week, Mexican President Enrique Peña Nieto proposed that Mexican citizens could legally possess up to an ounce of pot. The day before, Canada’s health minister stood at a United Nations podium and announced that her country would introduce new federal legislation to make cannabis legal by next year. Already, people are free to smoke marijuana in four U.S. states and the District of Columbia, and medical marijuana is allowed in almost half the country. Uruguay has fully legalized weed for sale. And a large chunk of South and Central America, including Brazil, Peru, Chile, Colombia, Ecuador and Costa Rica, has made marijuana more available in varying ways, whether it is for medicinal or recreational use. In the shift toward legalization of marijuana, the Americas have emerged as a leader. This is a remarkable shift for a region that includes some of the world’s leading producers of marijuana, coca and opium poppy, and where the U.S. government has spearheaded a decades-long campaign against cultivation of the substances. For many Mexicans, the prospect of such reform seemed unimaginable just a few years back. Using illegal drugs has long been taboo in this conservative, predominantly Catholic country – as is true in many other Latin American nations. Drug-trafficking groups have inflicted horrific violence on the country, with an estimated 100,000 people dying in the past decade as the cartels have battled for control of shipping lanes to the United States. Polls have shown that a majority of Mexicans oppose legalizing drugs, fearing it would increase addictions and crime. To have a Mexican president come out publicly in favor of loosening drug laws struck many people as historic. Peña Nieto’s initiative would make it legal for anyone to own up to 28 grams of marijuana – or one ounce — as long as it was intended for personal use. It would also permit the use of marijuana for medicinal purposes and make it easier to free prisoners who are being held on minor drug charges. The move came after five public forums held across Mexico this year to solicit public opinion and expert testimony on the prospect of changing drug laws. Mexicans were previously allowed to possess up to 5 grams. Peña Nieto spoke this week at a U.N. General Assembly special session on narcotics that had been scheduled at the request of Mexico, Colombia and Guatemala, the first such gathering in nearly 20 years. In his speech, he said that the policy of prohibition of drugs has failed and that countries needed to look for an alternative. His initiative would need legislative approval, although with presidential support many expect it has a good chance. The proposal was seen by legalization advocates as a welcome first step, although some argued that it was important to pass additional measures – such as allowing Mexican farmers to grow marijuana so that the medicinal industry could succeed. But opposition still is formidable in Mexico for blanket legalization of marijuana and other drugs. And critics of Peña Nieto’s plan say that increasing the quantity of marijuana that adults can smoke will simply lead to more consumption and will not significantly reduce the business of drug cartels, which make money in diverse ways, including extortion, human trafficking and the trafficking of cocaine and heroin. Elías Octavio Íñiguez Mejía of the right-leaning National Action Party, who serves as president of the health commission in the lower house of the National Congress, said he would consider medicinal use of marijuana, as long as studies on its effects were done in Mexico by Mexican institutions. But he remains firmly opposed to recreational use. 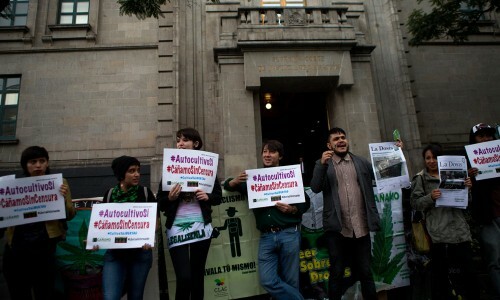 Past legislative efforts to decriminalize marijuana use in Mexico have failed. One of the driving forces behind such efforts was Fernando Belaunzarán, who served as a congressman from the left-wing Party of the Democratic Revolution (PRD) until last year. A year ago, Belaunzarán received a text message asking for help from Raúl Elizalde, a businessman in Monterrey whose 8-year-old daughter, Grace, suffered from severe epilepsy. Elizalde wanted to provide his daughter with marijuana oil, an experimental treatment available in the United States and Europe, but Mexico had banned the substance. Peña Nieto is considered a conservative on the drug issue, so his announcement surprised some Mexicans. But in recent months, the debate has changed. Last fall, the Supreme Court ruled that a group of activists could legally grow and sell marijuana. The Senate is also considering legislation to have a state-regulated marijuana industry. Earlier this month, Mexican newspapers reported that Peña Nieto wasn’t planning to attend the U.N. drug summit. But after reviewing the results of the public forums, Peña Nieto decided to go. After his speech, he shook hands with Belaunzarán, the former congressman who has long advocated for legalization. “Congratulations on this first step,” Belaunzarán told him. 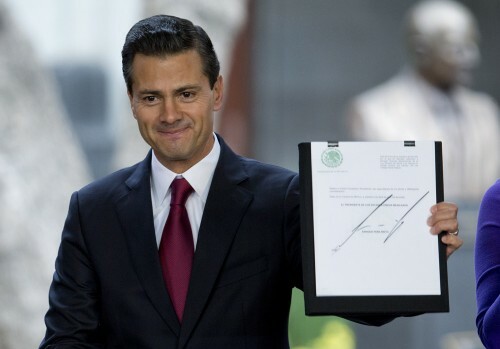 “It is a first step,” Peña Nieto agreed.